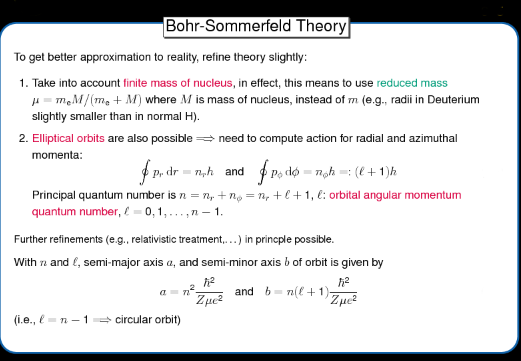 This is a blog entry devoted to the memory of a great scientist, N. Bohr, one of the greatest master minds during the 20th century, one of the fathers of the current Quantum model of atoms and molecules. One century ago, Bohr was the pioneer of the introduction of the “quantization” rules into the atomic realm, 8 years after the epic Annus Mirabilis of A. Einstein (1905). Please, don’t forget that Einstein himself was the first physicist to consider Planck hypothesis into “serious” physics problems, explaining the photoelectric effect in a simple way with the aid of “quanta of light” (a.k.a. photons!). Therefore, it is not correct to assest that N.Bohr was the “first” quantum physicist. Indeed, Einstein or Planck were the first. 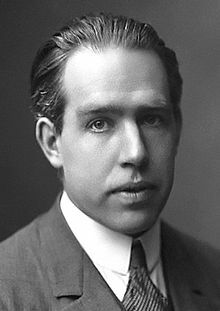 Said, this, Bohr was the first to apply the quantum hypothesis into the atomic domain, changing forever the naive picture of atoms coming from the “classical” physics. I decided that this year I would be writting something in to honour the centenary of his atomic model (for the hydrogen atom). When I was young, and I was explained and shown the Periodic Table (the ordered list or catalogue of elements) by the first time, I wondered how many elements could be in Nature. Are they 103? 118?Maybe 212? 1000? ? Or ? , Infinity? 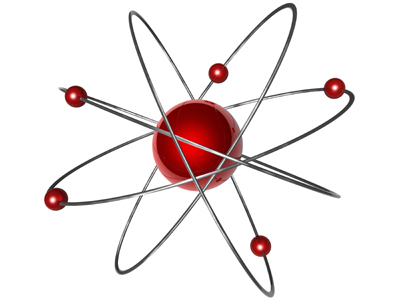 We must remember what an atom is…Atom is a greek word meaning “with no parts”. That is, an atom is (at least from its original idea), something than can not be broken into smaller parts. Nice concept, isn’t it? 1st. There is a well-defined ultimate “element”/”substance” and an ultimate “principle”. Matter is infinitely divisible. There are deep laws that govern the Universe and the physical Universe, in a cosmic harmony. 2nd. There is a well-defined ultimate “element”/”substance” and an ultimate “principle”. Matter is FINITELY divisible. There are deep laws that govern the Universe and the physical Universe, in a cosmic harmony. 3rd. There is no a well-defined ultimate “element”/”substance” or an ultimate principle. Chaos rules the Universe. Matter is infinitely divisible. 4th. There is no a well-defined ultimate “element”/”substance” or an ultimate principle. Chaos rules the Universe. Matter is finitely divisible. 1st. There is not a TOE. There is only a chaotic pattern of regularities we call “physical laws”. But Nature itself is ultimately chaotic and the finite human mind can not understand its ultimate description. 2nd. There is no TOE. There are only an increasing number of theories more and more precise or/and more and more accurate without any limit. As we are finite beings, we can only try to guess better and better approximations to the ultimate reality (out of our imagination) and the TOE can not be reached in our whole lifetime or even in the our whole species/civilization lifetime. 3rd. There is a well defined TOE, with its own principles and consequences. We will find it if we are persistent enough and if we are clever enough. All the physical events could be derived from this theory. If we don’t find the “ultimate theory and its principles” is not because it is non-existent, it is only that we are not smart enough. Try harder (If you can…)! If I added another (non Greek) philosophies, I could create some other combinations, but, as I told you above, I am not going to tell you Philosophy here, not at least more than necessary. “(…)Chemical analysis and synthesis go no farther than to the separation of particles one from another, and to their reunion. No new creation or destruction of matter is within the reach of chemical agency. We might as well attempt to introduce a new planet into the solar system, or to annihilate one already in existence, as to create or destroy a particle of hydrogen. All the changes we can produce, consist in separating particles that are in a state of cohesion or combination, and joining those that were previously at a distance(…)”. 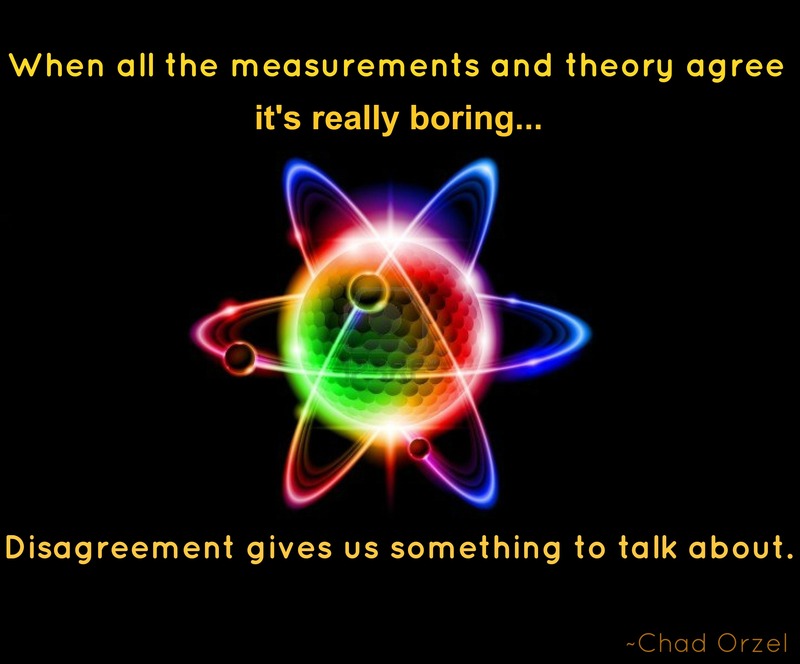 The reality of atoms was a highly debated topic during all the 19th century. It is worthy to remark that was Einstein himself (yes, he…agian) who went further and with his studies about the Brownian motion established their physical existence. It was a brillian contribution to this area, even when, in time, he turned against the (interpretation of) Quantum Mechanics…But that is a different story not to be told today. 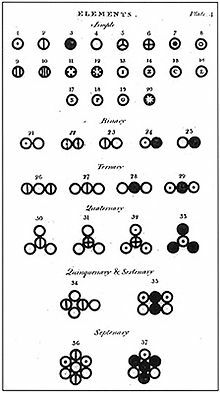 Dalton’s atoms or Dalton atomic model was very simple. 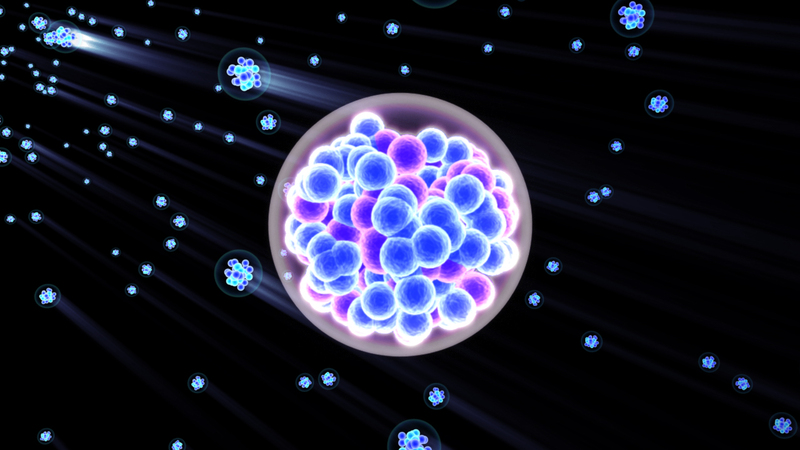 Atoms had no parts and thus, they were truly indivisible particles. 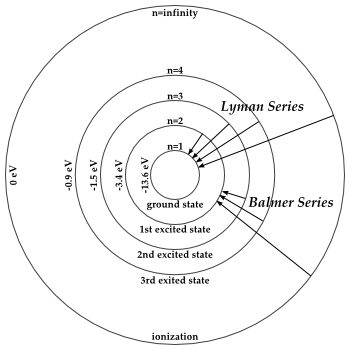 However, the electrical studies of matter and the electromagnetic theory put this naive atomic model into doubt. After the discovery of “the cathode” rays (1897) and the electron by J.J.Thomson (no, it is not J.J.Abrahams), it became clear that atoms were NOT indivisible after all! Surprising, isn’t it? It is! Chemical atoms are NOT indivisible. They do have PARTS. Thomson’s model or “plum pudding” model, came into the rescue…Dalton believed that atoms were solid spheres, but J.J.Thomson was forced (due to the electron existence) to elaborate a “more complex” atomic model. He suggested that atoms were a spherical “fluid” mass with positive charge, and that electrons were placed into that sphere as in a “plum pudding” cake. I have to admit that I were impressed by this model when I was 14…It seemed too ugly for me to be true, but anyway it has its virtues (it can explain the cathode ray experiment!). The next big step was the Rutherford experiment! Thomson KNEW that electrons were smaller pieces inside the atom, but despite his efforts to find the positive particles (and you see there he had and pursued his own path since he discovered the reason of the canal rays), he could not find it (and they should be there since atoms were electrically neutrial particles). 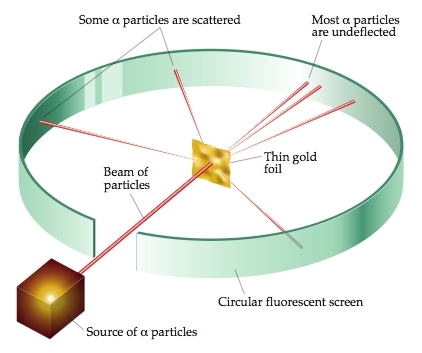 However, clever people were already investigating radioactivity and atomic structure with other ideas…In 1911, E. Rutherford, with the aid of his assistants, Geiger and Marsden, performed the celebrated gold foil experiment. 1st. Atoms are mostly vacuum space. 2nd. 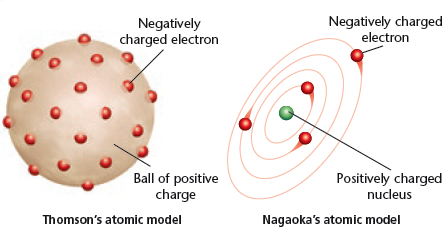 Atoms have a dense zone of positive charge, much smaller than the whole atom. It is the atomic nucleus! 3rd. Nuclei had positive charge, and electrons negative charge. 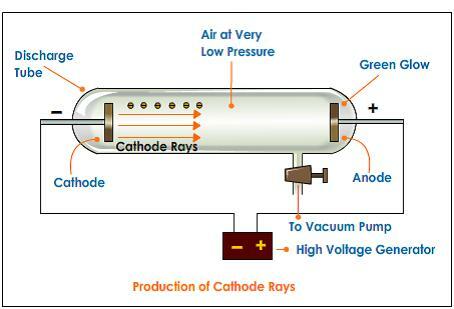 He (Rutherford) did not know from the beginning how was the charge arranged and distributed into the atom. He had to improve the analysis and perform additional experiment in order to propose his “Rutherford” solar atomic model and to get an estimate of the nuclei size (about 1fm or ). In fact, years before him, the japanase Nagaoka had proposed a “saturnian” atomic model with a similar looking. It was unstable, though, due to the electric repulsion of the electronic “rings” (previously there was even a “cubic” model of atom, but it was unsuccessful too to explain every atomic experiment) and it had been abandoned. 1st. 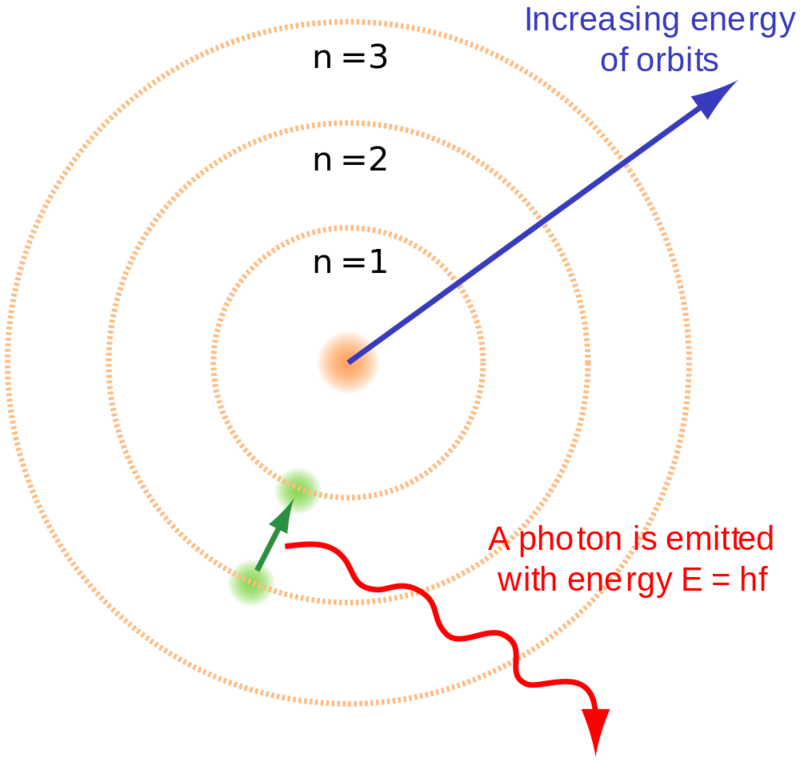 Electrons describe circular orbits around the proton (in the hydrogen atom). The centripetal force is provided by the electrostatic force of the proton. 2nd. 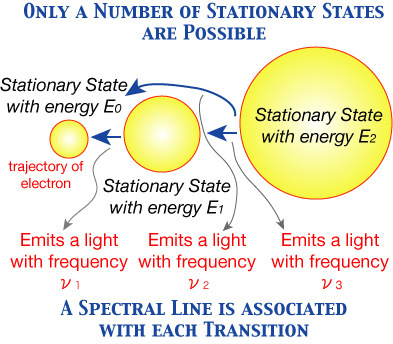 Electrons, while in “stationary” orbits with a fixed energy, do NOT radiate electromagnetic waves ( note that this postulate is againsts the classical theory of electromagnetics as it was known in the 19th century). 3rd. When a single electron passes from one energetic level to another, the energy transitions/energy differences satisfy the Planck law. That is, during level transitions, . (2) or with and a positive integer. Remark: and are the Planck constant and the reduced Planck constant, respectively. Please, check it yourself! :D.
Therefore, the consequence of the rescaling of the nuclear charge is that energy levels are “enlarged” by a factor and that the orbits are “squeezed” or “contracted” by a factor . 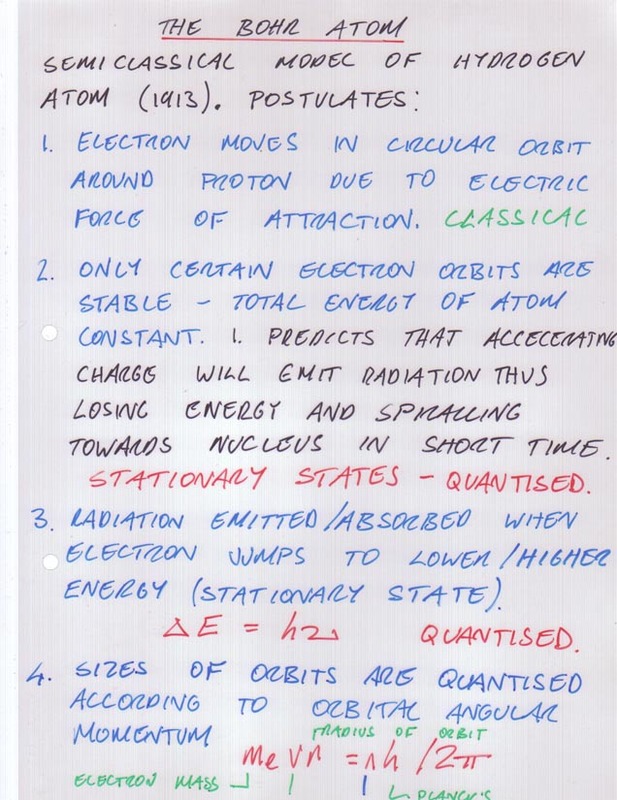 Exercise: Can you obtain the energy levels and the radius for the positronium (an electron and positron system instead an electron a positron). What happens with the muonium (strange substance formed by electron orbiting and antimuon)?And the muonic atom (muon orbiting an proton)? And a muon orbiting an antimuon? And the tau particle orbiting an antitau or the electron orbiting an antitau or a tau orbiting a proton(supposing that it were possible of course, since the tau particle is unstable)? 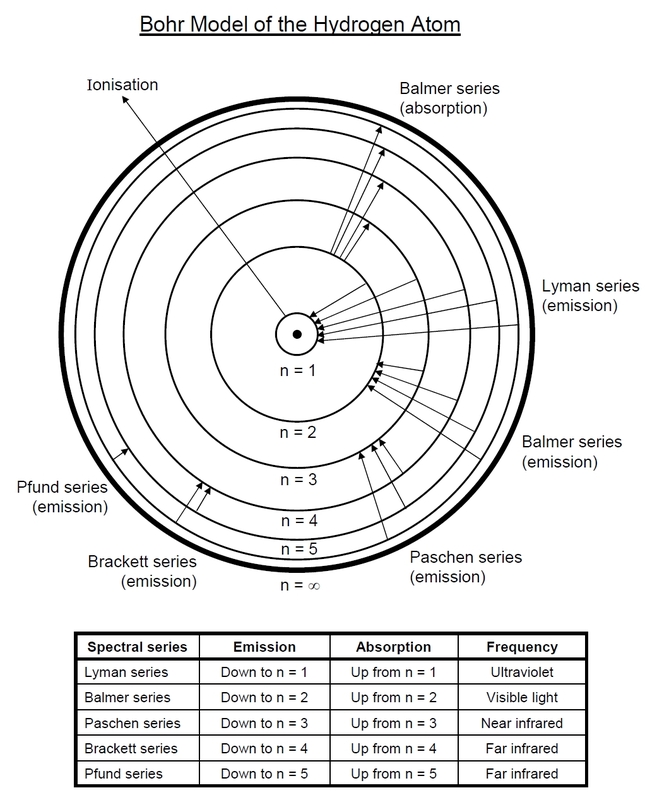 Calculate the “Bohr radius” and the “Rydberg” constant for the positronium, the muonium, the muonic atom (or the muon-antimuon atom) and the tauonium (or the tau-antitau atom). Hint: think about the reduced mass for the positronium and the muonium, then make a good mass/energy or radius rescaling. so, the hydrogenic atoms have a “enlarged” electron velocity in the orbits, by a factor of . If you plug Z=138 or more into the above equation from the Dirac spectrum, you obtain an imaginary value of the energy, and thus an oscillating (unbound) system! 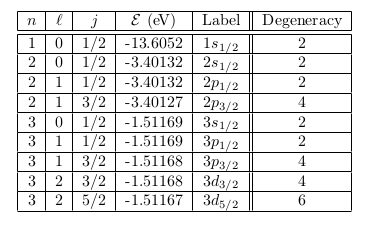 Therefore, the problem for atoms with high Z even persist taking the relativistic corrections! What is the solution? Nobody is sure. Greiner et al. suggest that taking into account the finite (extended) size of the nuclei, the problem is “solved” until . Beyond, i.e., with , you can not be sure that quantum fluctuations of strong fields introduce vacuum pair creation effects such as they make the nuclei and thus atoms to be unstable at those high values of Z. Some people believe that the issues arise even before, around Z=150 or even that strong field effects can make atoms even below of Z=137 to be non-existent. That is why the search for superheavy elements (SHE) is interesting not only from the chemical viewpoint but also to the fundamental physics viewpoint: it challenges our understanding of Quantum Mechanics and Special Relativity (and their combination!!!!). 1st. The feynmanium (Fy) or Untriseptrium (Uts) is the last element of the Periodic Table. (i) B Fricke, W Greiner and J T Waber,Theor. Chim. Acta, 1971, 21, 235. 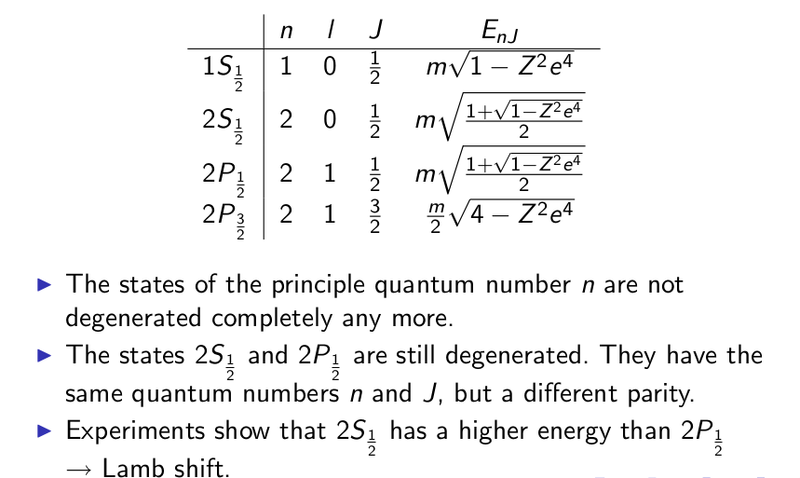 (ii)W Greiner and J Reinhardt, Quantum Electrodynamics, 4th edn (Springer, Berlin, 2009). 3rd. Other predictions of an end to the periodic table include Z = 128 (John Emsley) and Z = 155 (Albert Khazan). Even Seaborg, from his knowledge and prediction of an island of stability around , left this question open to interpretation and experimental search! 4th. There is no end of the Periodic Table. According to Greiner et al. in fact, even when superheavy nuclei can produce a challenge for Quantum Mechanics and Special Relativity, indeed, since there is always electrons in the orbitals (a condition to an element to be a well-defined object), there is no end of The Periodic Table (even when there are probabilities to a positron-electron pair to be produced for a superheavy nuclei, the presence of electrons does not allow for it; but strong field effects are important there, and it should be great to produce these elements and to know their properties, both quantum and relativistic!). Therefore, it would be very, very interesting to test the superheavy element “zone” of the Periodic Table, since it is a place where (strong) quantum effects and (non-negligible) relativistic effects both matter. Then, if both theories are right, superheavy elements are a beautiful and wonderful arena to understand how to combine together the two greatest theories and (unfinished?) revolutions of the 20th century. What awesome role for the “elementary” and “fundamental” superheavy (composite) elements! Probably, there is no limit to the number of (chemical) elements in our Universe… But we DO NOT KNOW! In conclusion: what will happen for superheavy elements with Z >173 (or Z>126, 128, 137, etc.) remains unresolved with our current knowledge. And it is one of the last greatest mysteries in theoretical Chemistry! Final remarks (for experts only): Some comments about the self-adjointness of the Dirac equation for high value of Z in Coulombian potentials. It is a well known fact that the Dirac operator for the hydrogen problem is essentially self-adjoint if Z<119. Therefore, it is valid for all the currently known elements (circa 2013, June, every element in the Periodic Table, for the 7th period, has been created and then, we know that chemical elements do exist at least up to Z=118 and we have tried to search for superheavy elements beyond that Z with negative results until now). However, for any “self-adjoint extension” requires a precise physical meaning. A good idea could be that the expectation value of every component of the Hamilton is finite in the selected basis. Indeed, the solution to the Coulombian potential for the hydrogenic atom using the Dirac equation makes use of hypergeometric functions that are well-posed for any . If Z is greater than that critical value, we face the oscillating energy problem we discussed above. So, we have to consider the effect of the finite size of the nucleus and/or handle relativistic corrections more carefully. It is important to realize this and that we have to understand the main idea of all this crazy stuff. This means that the s states start to be destroyed above Z = 137, and that the p states begin being destroyed above Z = 274. Note that this differs from the result of the Klein-Gordon equation, which predicts s states being destroyed above Z = 68 and p states destroyed above Z = 82. In summary, the superheavy elements are interesting because they challenge our knowledge of both Quantum Mechanics and Special Relativity. What a wonderful (final) fate for the chemical elements: the superheavy elements will test if the “marriage” between Quantum Mechanics or Special Relativity is going further or it ends into divorce! 1) Is there an ultimate element? 2) Is there a theory of everything (TOE)? 3) Is there an ultimate chemical element? 4) Is there a single “ultimate” principle? 5) How many elements does the Periodic Table have? 6) Is the feynmanium the last element? 7) Are Quantum Mechanics/Special relativity consistent to each other? 8) Is Quantum Mechanics a fundamental and “ultimate” theory for atoms and molecules? 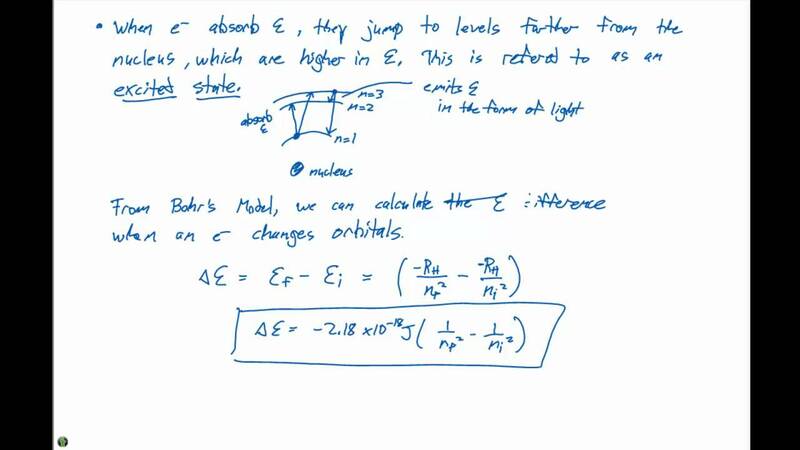 9) Is Special Relativity a fundamental and “ultimate” theory for “quick” particles? 10) Are the atomic shells and atomic structure completely explained by QM and SR? 11) Are the nuclei and their shell structure xompletely explained by QM and SR? 12) Do you think all this stuff is somehow important and relevant for Physics or Chemistry (or even for Mathematics)? 13) Will we find superheavy elements the next decade? 14) Will we find superheavy elements this century? 15) Will we find that there are some superheavy elements stable in the island of stability (Seaborg) with amazing properties and interesting applications? 16) Did you like/enjoy this post? 17) When you was a teenager, how many chemical elements did you know? How many chemical elements were known? 18) Did you learn/memorize the whole Periodic Table? In the case you did not, would you? 19) What is your favourite chemical element? and we observe that it would spoil the relativistic invariance of the field equation!!!!!!! That is a crucial observation!!!! if . But this is impossible! Why? The Lie structure constants are “stable” (or invariant) under similarity transformations. You can not change the structure constants with similarity transformations. and this contradicts the fact that !!! and is a “pure phase” often referred as the “Majorana phase”. and then . However, it would NOT BE a Lorentz invariant anymore! If the continuity equation holds. 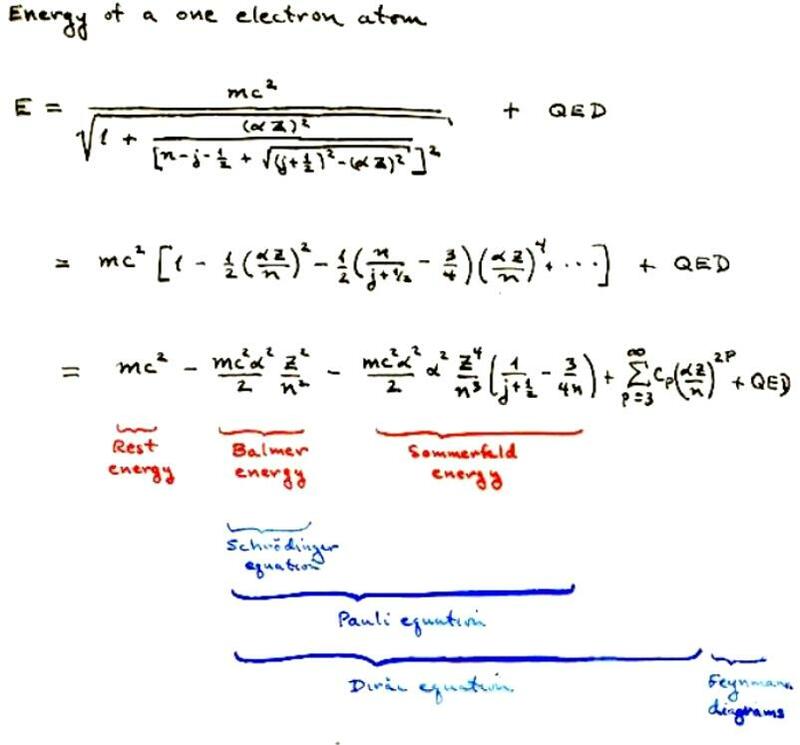 In the absence of magnetic charges, this last equation is equivalent to or . 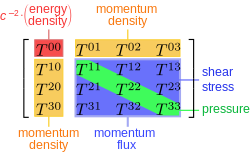 Remark: Even though the bivector/sixtor field couples to the spatial part of the 4D electromagnetic current, the charge distribution is encoded in the divergence of the field itself and it is NOT and independent dynamical variable as the current density (in 4D spacetime) is linked to the initial conditions for the charge distribution and it fixes the actual charge density (also known as divergence of at any time; is a bispinor/bivector and it is NOT a true spinor/vector). since because there are no magnetic monopoles. This means that for the case of pure rotations both bivector/bispinors and current densities transform as vectors under the group SO(3)!!!! 1st. A mass term analogue to the Marjorana or Dirac spinor equation does NOT arise in 4d electromagnetism due to the interplay of relativistic invariance and gauge symmetries. That is, bivector/bispinor fields in D=4 can NOT contain mass terms for group theoretical reasons: Lorentz invariance plus gauge symmetry. 2nd. The Dirac-like equation can NOT be interpreted as a Dirac equation in D=4 due to relativistic symmetry, but you can write that equation at formal level. However, you must be careful with the meaning of this equation! 3rd. In D=2 and other higher dimensions, Majorana “mass” terms arise and you can write a “Majorana mass” term without spoiling relativistic or gauge symmetries. Majorana fermions are particles that are their own antiparticles! Then, only neutrinos can be Majorana fermions in the SM (charged fermions can not be Majorana particles for technical reasons). 4th. The sixtor/bivector/bispinor formalism with has certain uses. For instance, it is used in the so-called Ungar’s formalism of special relativity, it helps to remember the electromagnetic main invariants and the most simple transformations between electric and magnetic fields, even with the most general non-parallel Lorentz transformation. In the next group theory threads we are going to study the relationship between Special Relativity, electromagnetic fields and the complex group . and where the numerical prefactor is conventional ( you can give up for almost every practical purposes). and where we have used natural units for simplicity. and then for . Experts in Clifford/geometric algebras will note that these matrices are in fact “Dirac matrices” up to a conventional sign. In summary: the sixtor equation is a Dirac-like equation (but of course the electromagnetic field is not a fermion!). and it transforms like a VECTOR field under Lorentz transformations, while the previous current are the components of some stress-energy-momentum !!!! They are NOT the same thing! In fact, transform under the and (complex conjugated) representation of the proper Lorentz group. Remark: Belinfante coined the term “undor” when dealing with fields transforming according to some specific representations of the Lorentz group.